I've remarked in the past that one of the biggest differences I experience between people who collect classic monster memorabilia and those who collect Japanese robots is how much the monster fans dig the ephemera. They tend not to limit themselves to just the toys of their favorite characters and instead will hoard all of the smaller items such as drinking glasses, coloring books, jigsaw puzzles, etc. 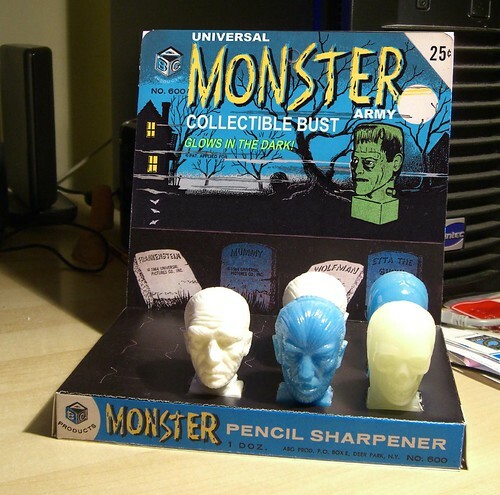 One of the more popular things to collect are these blow molded Universal Monster pencil sharpeners. Produced by A.B.G. Products in 1964, they were sold from a cardboard counter top display featuring original artwork. Sometime in the 1990s a warehouse find occurred, and several of these displays are still around today. Each display contains twelve slots to store your pencil sharpeners in and four different characters were produced. There are Frankenstein, The Mummy, The Wolf Man, and Etta the Ghoul. 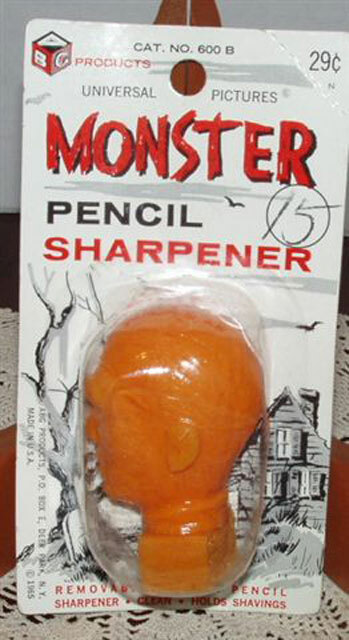 Each character's name is printed on a tombstone on the box indicating where to store each sharpener. Unfortunately, each character was actually produced in a total of FIVE different colors (green, gray, purple, orange and white). Meaning if you were lucky enough to get each one in each color (admittedly, a very difficult proposition), you would not have enough slots to store them all! Characters and colors vary in rarity, but one thing seems true across the board. Regardless of character, any one of these in white is hard to come by. Out of all of the characters produced, Frankenstein is by far the hardest to find and the most desirable. For whatever reason, there just doesn't seem to be many of these out there and when they do show up, competition is fierce and final bid prices can be very high. The Wolf Man is the easiest to get and any color besides white can be purchased on Ebay for just a few dollars at any given time. I was lucky to stumble onto my white one while browsing tables at the Brimfield Antique And Collectible Show a couple of summers back. Etta the Ghoul is a strange choice of character for the simple reason that it appears to be a completely original character designed specifically for this line. One collector, however, proposes the idea that the design might be intended to represent Mrs. Bates from Psycho. I like this idea, but that may a biased opinion as I think it would lend more prestige to the piece if it were based on something significant like that. Etta seems difficult to find in orange and I've never even seen one in white. Lastly, I should point out that these were also released the following year (with a price increase to $0.29!) and were then sold individually packed onto blister cards. Examples of these turn up very rarely. While these may seem silly to some, they are one of my favorite things to collect and I really love the appearance of these vintage counter display pieces in my collection. While I would love to manage to acquire one of each of these, my first task is to hopefully get the pieces I need to get three full rows of sharpeners all in the same color. If you see any of these I need, let me know! I love the dedication to finding all the variations of each one. Now that you have filled up a box, are you still looking for more variants? If so, are you looking for another display box also?